Sophisticated, Vibrant, Social, Accommodating, fun, City smart, stunning, Well connected. Great things take time, and so they should. Student One Elizabeth Street is our most ambitious and elaborate residence yet. We have a strong sense of responsibility to our residents to build Elizabeth’s two student accommodation towers with the highest standards in mind. We also have a responsibility to the people of Brisbane to ensure the historic Elizabeth Arcade is both reinvented and also restored to its former glory. Because of our sky-high standards, Student One Elizabeth Street is opening in stages across 2019. The first stage opened right on time for the start of Semester One, with all communal areas such as gym, cinema, study spaces, games room and communal kitchen, all based on the first-floor and the majority of Elizabeth Tower fully operational. The Charlotte Street tower including rooftop recreational area will open soon after, followed by the reopening of the historic Elizabeth Arcade in May 2019. The doors to Student One Elizabeth Street opened February 23rd, 2019. Residents can now expect the same premium student experience that all Student One residents have had before them. In the rare event that your experience is impacted by our scheduled openings, then you can be sure our team will be there to make things right. If you have any questions about the opening of Elizabeth Street, then please don’t hesitate to contact the Student One team. Throw away your compass and there’s no need for Google Maps. Student One Elizabeth Street is at the very centre of all things Brisbane City. Elizabeth Street Residents will have Brisbane’s very best shopping, dining, and entertainment precincts right at their doorstep. 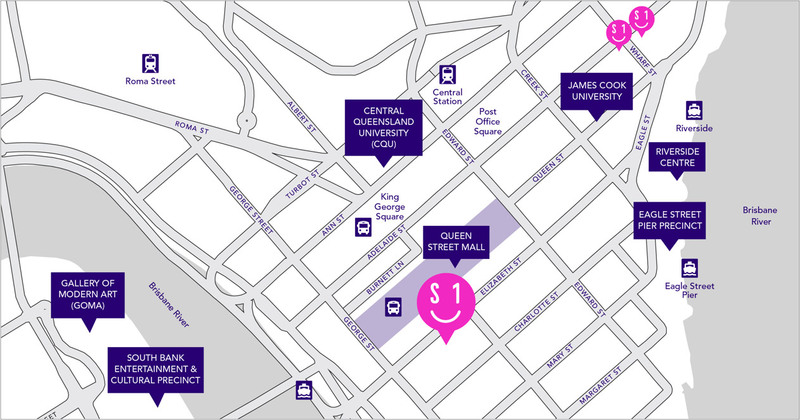 And don’t forget the access to Brisbane’s main bus terminal underneath the Myer Centre. Want to live with friends and other students? Prefer flying solo? Maybe you’re even sharing with your partner. No matter how you want to live your best student life, we’ve got you covered with our large variety of multi-share apartments and private studios across Elizabeth street and Charlotte street towers. It’s all of the extras that help make us Brisbane’s premium student accommodation. Student One Elizabeth Street has dedicated study and social spaces, a rooftop cinema, a state-of-the-art gym, 24/7 onsite staff, and free unlimited WiFi to help students truly live better. Be one of the first to meet Elizabeth and book your site tour now.